Reach-in refrigerators are a staple of any commercial kitchen, proving ample storage space and keeping the ingredients you use the most easily accessible and at a safe temperature. These refrigerators can be used to store everything from fresh produce to trays. 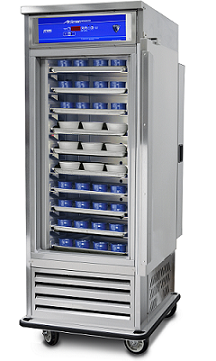 The FWE Mobile Refrigerated Air Screen is one piece of equipment every kitchen needs for cold food holding. 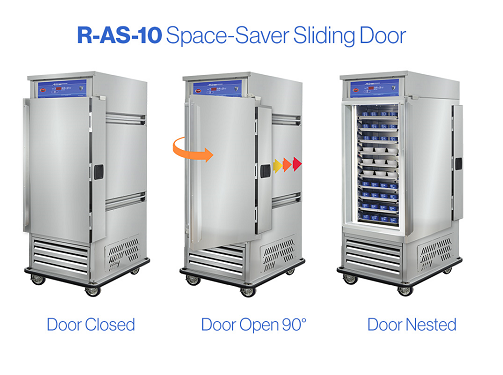 The Reach-in Refrigerated Air Screen (R-AS-10) multi-fan system provides fast cool down time and is able to maintain cabinet temperatures for extended periods of time, with the door open. This cabinet is able to maintain an interior temperature of 45°F or less with the door open for 45 to 90 minutes, depending on the conditions. These units are dual purpose. When the door of the unit is closed, the unit can be used as a reach-in refrigerator. The forced air cabinet is a highly efficient refrigeration system that provides faster pull-down and recovery times than standard refrigerators. When the door is opened, a series of blower fans create a 'wall' of air and areas of pressure, localizing a unique pattern of air from both the left and right side walls, as well as from the top. This movement across the cabinet opening helps to keep the cold air in and the warm air out of the food zone. The cabinet is specifically designed to help maintain and extend periods of time with the door open, contributing to safer product storage during service hours. The bottom mounted compressor raises the interior of the refrigerator. Items at the bottom of the unit are quick and easy to access and extra storage space is available on the top portion of the unit. The bottom mounted compressor is also easy to access, often making maintenance of the unit easier and cheaper. Exclusive 'Food Sentry' intuitive controls are easy to use and highly accurate. Oversized, high demand components assure rapid pull-down time and quick recoveries. The Air Screen is designed for hospitals, nursing homes, in-flight or other tray line operation and institutional use. The compact design allows users to take advantage of available vertical space in kitchen areas, without sacrificing needed floor space. Unique tray slides design hold trays and pans by the bottom for greater support for heavy food items. Tray slides are removable for thorough interior cleaning. Engineered to answer your most demanding needs, FWE's all stainless steel heavy-duty and welded construction delivers the performance and dependability you require. Cabinet and door are fully insulated to help maintain proper interior temperature. Move the cabinet where you need it! The bottom mounted compressor is built on a heavy-duty, one-piece stainless steel tubular frame, reinforcing members and design engineered constructed to absorb vibration and shocks associated with demanding and abusive working environments. Full swing door opens to 270° to lay flat against cabinet and is secured by a magnetic door 'catch' for easy access. When the door is closed, it is secured magnetically, removing the need of a cumbersome door latch. The Space-Saver Sliding Door is a popular optional accessory that tucks the door compactly into the side of unit without requiring a wide swing radius. Operators are able to open and close without moving the unit or overlapping nested unit, allowing for an open door in compact spaces. The most important thing you can do to insure a long, reliable life for your cabinet is to regularly maintain and clean the condensing unit. The unit comes with a clean condenser reminder light. It will illuminate approximately every 60 days of run time to remind you it's time to clean. Keeping the condenser clean allows the unit to operate efficiently, use less energy and achieve top performance values. HDM Security Packages are available to meet correctional needs. To learn specifics, see a full catalog or correctional equipment offered by FWE and see photos, visit www.fwe.com/learn/An-Introduction-to-Correctional-Foodservice-Equipment. FWE offers a variety of optional accessories for the R-AS-10, to learn specifics, see literature, additional photos and get a quote, visit www.fwe.com/product/r-as-10.